On 28 January, chaos spread across Egypt, with the withdrawal of the police force and the burning of police stations. Prisons were emptied and thugs roamed the streets. Who gave the order? Egypt’s old regime, headed by ousted President Hosni Mubarak, used a number of tactics to try and stop the 25 January Revolution from gaining ground. Many feel that the most devastating of those were in the security field. During the 18 days of the revolution, Egyptians witnessed unprecedented chaos break out across the country. In a matter of hours, police stations were burnt, prisons opened, thugs prowled the streets and the country's vast police force vanished, leaving citizens to fend for themselves. All the while, the state media played a pivotal role, constructing a picture of wanton destruction, uncontrollable chaos, and fear. Different theories and scenarios have been put forward to explain the devastating collapse of security in Egypt. The scenario that has gained the most support is that it was a contingency plan orchestrated to deal with any large scale uprising of the people. It was designed to spread terror among citizens so as to force them to demand an end to the protests and a return to stability as guaranteed by the regime. One State Security official who spoke to Ahram Online on condition of anonymity revealed this scenario before it took place. He said the prisons would be opened, thugs would be all around the country, and many buildings and police stations would be set on fire. This indeed happened. But who burned the police stations? “It’s simple; we the people did that,” says Mohamed Hussein, a 21-year-old resident of Boulak El-Dakrour. Hussein explained that police officers started opening fire on protesters while they were on their way to join the Tahrir protests, killing around four of them and injuring several others. One of the dead was Hussein’s cousin. “Seeing my cousin dying in front of my eyes made me set this police station on fire,” he said. After the station was torched, residents confiscated all the weapons. For days, residents of the area walked around with guns and rifles, until one day a respected elderly man in the area decided to put an end to the fiasco and demanded that all weapons be returned. They were then stored in the area’s mosque until things calmed down, and thereafter handed over to the army. While Boulaq El-Dakrour citizens agreed it was they who set the police station on fire, citizens of the Cairo suburb of Darb El-Ahmar tell conflicting stories. Four residents sitting at a café there had a heated conversation about what took place on 28 January, known as the “Friday of Rage.” The young men began arguing loudly, cutting each other off and gesticulating wildly as each tried to express the terror they witnessed. They said a small protest began in front of the police station. The police, to try and disperse the protesters, fired live ammunition. One stray bullet hit a young man standing inside a shop, right where the group of men were standing. The bullet killed him instantly. The events, they say, took place around noon, after Friday prayers. A large patch of dried blood under their feet is proof, they say, and that their account is true. However, one block away, Hisham Arafa, the owner of a small cassette shop, has a different version of events. A small protest, he said erupted before the prayers, but the police quickly dispersed the protesters. Another protest took place, after the prayers. This time, thugs carrying knives and sticks scared the protesters away. The suburb went quiet, until 7:30pm, when 15 motorcycles, each carrying three thugs, entered the area. The thugs got off their bikes and began burning and looting the police station and also set several cars in the area on fire. They sucked petrol out of cars and used it to make firebombs to set the police station on fire. “They also tried to burn some shops and civilian owned cars, but their leader told them not to and to only focus on the station,” remembers Arafa. In areas like Darb El-Ahmar, there are two groups of people who stand out: thugs and police officers. Residents of the suburb know their names by heart. Thugs usually have pseudo names like "Hawary", “Imbaby", “El-Shaer", and “El-Asd", and many of the locals recognised them on the motorcycles. One of those, they said, was a thug, often hired by a certain National Democratic Party (NDP) member to bully locals to vote for him during parliamentary elections. He was among the group of thugs that looted and attacked the police station. The terror continued until midnight, when the thugs left leaving the area’s residents cowering in terror in their homes. In the Seyada district of Cairo, similar chaos broke out, but people also give conflicting accounts of events. The burnt out police station in the middle of the district is testimony to the violence that broke out. Residents say that a peaceful protest had begun in the area and headed to the police station. The police panicked and began firing shots from the roof of the building. The shots injured several civilians, which spurred an angry mob into attacking and looting the station. The officer in charge donned a galabeya and made his escape from the backdoor, leaving the protesters to burn the station. “We were furious at them for shooting at us and that’s why we went in,” says Haytham Ahmady, one of the men involved in the looting. But Hisham Gabr, who also witnessed the incident, had a different version of events. Yes, says Gabr, a protest took place in front of the station. Yes, officers shot live ammunition at the crowd. But, he says, it wasn’t the people’s idea to attack the station. While investigations are still pending on what exactly happened that day, analysts have traded theories on what was behind the chaos. Major General Sameh Seif El-Yezl, a security and strategic expert, says he doesn’t believe there was an organised plan to burn police stations throughout the country. El-Yezl says that it worked in a domino effect. The first station burned by angry protesters; the people in the adjoining neighbourhood heard about it and decided to burn their station too. On the other hand, state media appeared set on frightening the people during that time. Terrified Egyptians used to call in and report that there are thugs everywhere. Some women cried on air while describing the scene. Later on, leaked documents from Nasr City State Security Investigations revealed that state media was ordered to interview such women, in order to spread fear and ask men protesting in Tahrir Square to come back home and join neighbourhood committees to protect their families and homes. After the police force abandoned the country, many prisons were opened late at night, 28 January, and prisoners released. Surprisingly, a mere few hours later, escaped Palestinian political detainees had made it all the way to Gaza and were giving TV interviews about the joys of returning home after being imprisoned in Egypt for so long. Mohamed Fawzy, a former assistant to the minister of interior, says that the prison attacks were a separate plan by a different organised group, probably Hamas. Fawzy explains that when this group noticed the chaos that resulted after the jails were looted, they created a small conspiracy to release political prisoners from jail. There are several reasons why Fawzy believes this. First, prisons, like El-Mark, were opened from the outside; if the officers there had wanted to release the prisoners they would have opened the doors from the inside, he says. Second, the political detainees who were released found cars waiting for them outside. These cars took them straight to Gaza. The rest of the prisoners, says Fawzy, were released as camouflage. “They had to create chaos so that it appears that their detainees escaped with the others,” he says. The prisoners may have escaped, but the thugs remained. Hired thugs, police thugs, or thugs who just took advantage of the situation, it didn’t matter. To the people, they were an uncontrollable group who terrorised them for days. 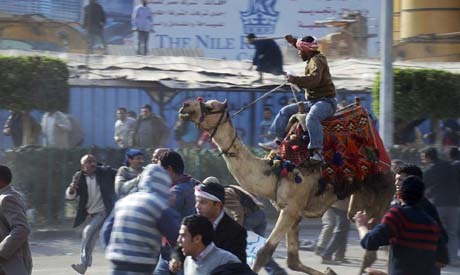 That is, until 2 February, dubbed the “Battle of the Camel,” when thugs riding camels and horses entered Tahrir Square, attacking protesters, resulting in several deaths and countless injuries. Despite the fact that many were caught by protesters, who discovered that they were either from the police force or hired by members of the government, no official account has been provided, which has baffled many. Ziad El-Elimi, lawyer and a member of 25 January Coalition, says that the protesters were shocked when they found out who the thugs worked for. “I have several IDs of these thugs that proves they are State Security members,” he said. He also explained that whoever sent them was not expecting that they would be caught, which is why they went with their IDs. There have also been countless YouTube videos from thugs who were caught in the battle who repeatedly confessed that they were hired to attack the protesters in exchange for money, sometimes as little as LE50. A high ranked security expert in the army, who preferred to stay anonymous, says that it was the NDP and members of the old regime who planned the attack to make the revolution fail. “They wanted to destroy and eliminate; it was part of their counter revolution strategy,” he says. The expert pointed out that the fact that the Supreme Council of the Armed Forces released a statement just hours before the Battle of the Camel asking protesters to evacuate Tahrir Square is suspicious. Now, more than a month has passed and insecurity is still widespread across the country. Military forces and ordinary citizens are taking care of the streets and neighbourhoods. Thugs with weapons, swords and drugs are tormenting people across Egypt, leaving most in agreement that the police should return to the streets in full capacity. who let the thugs out? It is quite clear thet it is the old regime.Mubarak & all ministers ionvolved should be sentenced like in every free country. as to the constitution with these minor changes the old regime will continue,The Ndp party should be abolished.& no one of them allowed to participate any more in any election. Ptherwise they continue to follow the old tradition.corruption, intimidation and take over the government. This is what journalism is about. It takes a long way to tip an elephant. Now, it's a matter of credibility and how this should be gained. That's the first issue. To gain credibility. Realese all detained individulas who are not thugs. Say, again, it's a long way to tip an elephant, after 30 years, in order to fullfill the "immense" expectaions of the revolution. Make people aware that the society can't change 30 years of oppression from one day to another. Postpone the constinutional referendum. It's to early. Ask for patience. Say that the task takes years to fullfill, but as a very start make sure that the freedom of expression and debate (the next constiution) is respected.